"The AERI data record demonstrates that the downwelling infrared radiance is decreasing over this 14-yr period in the winter, summer, and autumn seasons but it is increasing in the spring; these trends are statistically significant and are primarily due to long-term change in the cloudiness above the site." The findings contradict the main tenet of AGW theory which states increasing greenhouse gases including the primary greenhouse gas water vapor and clouds will cause an increase of downwelling longwave infrared "back-radiation." The paper also finds a negative trend in precipitable water vapor, as do other global datasets, again the opposite of predictions of AGW theory that warming allegedly from CO2 will increase precipitable water vapor in the atmosphere to allegedly amplify warming by 3-5 times. Is the unexpected decrease in water vapor the cause of the decrease in downwelling IR? Global datasets also show an increase of outgoing longwave IR radiation to space from greenhouse gases over the past 62 years, again in contradiction to the predictions of AGW theory. Gero, P. Jonathan, David D. Turner, 2011: Long-Term Trends in Downwelling Spectral Infrared Radiance over the U.S. Southern Great Plains. J. Climate, 24, 4831–4843. 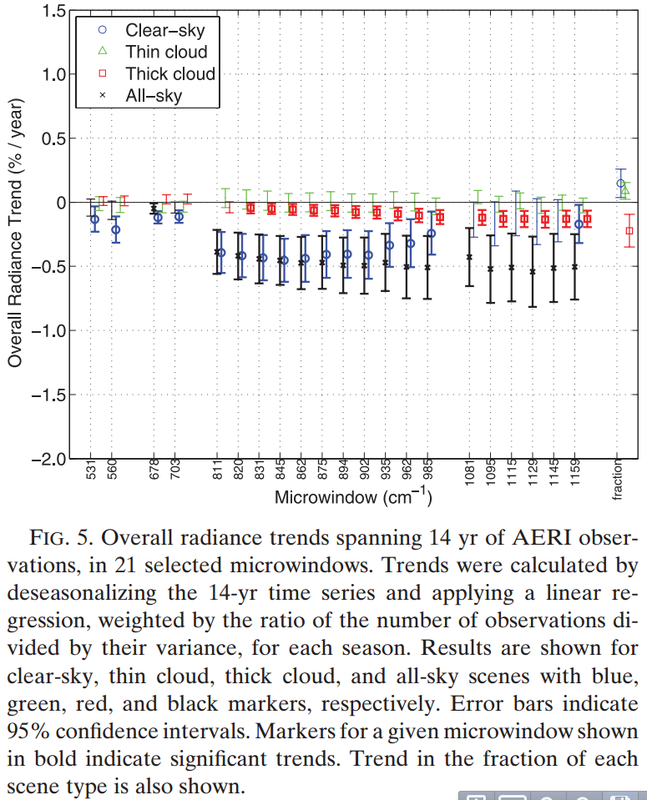 A trend analysis was applied to a 14-yr time series of downwelling spectral infrared radiance observations from the Atmospheric Emitted Radiance Interferometer (AERI) located at the Atmospheric Radiation Measurement Program (ARM) site in the U.S. Southern Great Plains. The highly accurate calibration of the AERI instrument, performed every 10 min, ensures that any statistically significant trend in the observed data over this time can be attributed to changes in the atmospheric properties and composition, and not to changes in the sensitivity or responsivity of the instrument. The measured infrared spectra, numbering more than 800 000, were classified as clear-sky, thin cloud, and thick cloud scenes using a neural network method. 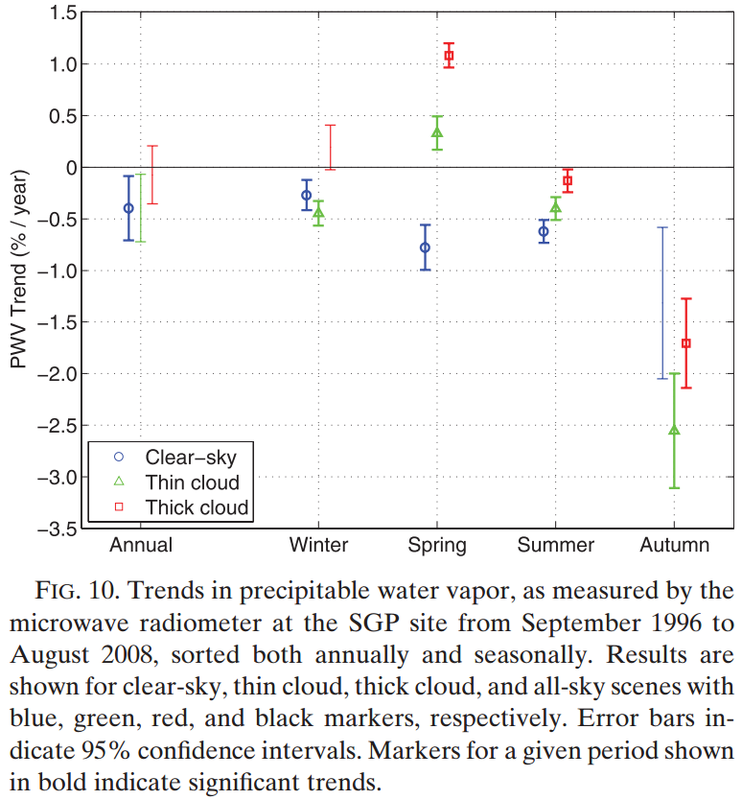 The AERI data record demonstrates that the downwelling infrared radiance is decreasing over this 14-yr period in the winter, summer, and autumn seasons but it is increasing in the spring; these trends are statistically significant and are primarily due to long-term change in the cloudiness above the site. The AERI data also show many statistically significant trends on annual, seasonal, and diurnal time scales, with different trend signatures identified in the separate scene classifications. Given the decadal time span of the dataset, effects from natural variability should be considered in drawing broader conclusions. Nevertheless, this dataset has high value owing to the ability to infer possible mechanisms for any trends from the observations themselves and to test the performance of climate models. I found this very interesting as it seems that the first step in establishing a link between climate and CO2 would be to measure the downward infrared radiation from so-called greenhouse gasses. In fact, this week I posted a similar query on WUWT and did not get any responses. Yes that would be of interest since the usual naysayers like Mosher are dismissing these 800,000 observations as not important since they are from a single site. I don't know of any other studies that have long-term records including changes in cloud cover. I find it incredible that there is so little data available. I am only an engineer, not a scientist, and that would be the first thing that I would study. Here is what I posted on WUWT: Since it has been known since the late 19th century that carbon dioxide absorbs infrared radiation, why wouldn’t the next logical research step be to go out and measure the infrared radiation and quantify the amount coming from CO2? The wave length that CO2 absorbs and radiates has been known for some time. Was such research ever done and is the data available? I found no mention of this in the IPCC reports, but I might have missed it. Since the CO2 in the atmosphere was measured at Mauna Loa since 1958, why wasn’t similar research done to measure the affect of CO2? All I have been able to find is spectrographs showing infrared radiation vs. wave length which highlights bands for different greenhouse gasses for a specific time, but nothing showing change over time. Does such data exist? I would expect that someone would have thought of doing this type of research. Dr. James Hansen, having gotten his degrees at the University of Iowa under James Van Allen and having studied the atmosphere of Venus based on infrared radiation, would have had the background to initiate such as study. I would also think that they would do a study at a dry cloudless area to eliminate water vapor and clouds that would distort the data. The warmist climate scientists do not collect, or alternatively ignore, data that might blow a hole in their pet theory. I have also found it impossible to find any research that shows empirical evidence of the AGW theory. I believe it was Dr. Judith Curry who became a sceptic as a result of her husband, fed up with her always going on about man made global warming, challenged her to show him the proof. Determined to put him right, she accepted the challenge, only to find there really was no real evidence. There are many measurements of downwelling IR, but most, as far as I am aware don't carefully separate out clear sky, thick & thin clouds or have so many observations over a long time period. Without such detailed observations it is very difficult to detect the small trends with 95% certainty as found by this paper.